The fun strategic board game is all about taking the risk and conquering all the countries on the map. Surprisingly the competitors are no other than your friends. 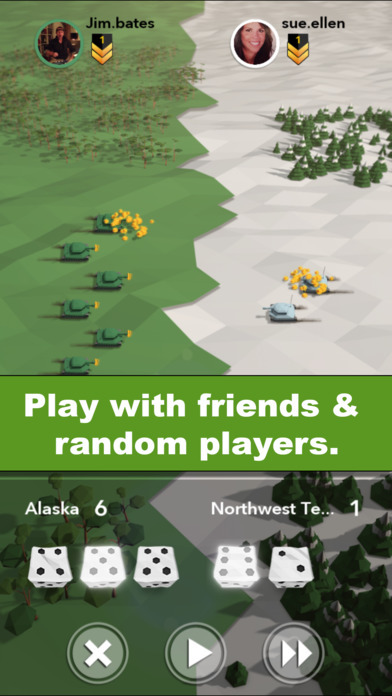 Attack your friends in a push based game. Turn by turn select the area, place the troops and attack the enemy. If the gamer wins the battle he will able to conquer the country and will also get rewards for winning the battle. The gamers even get a reward after every turn. 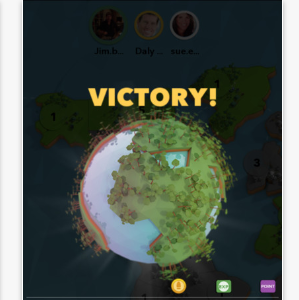 The game is all about showing courage and intelligence against your opponents to conquer the countries on the map. The gamer can see his progress, stats and data such as Games won, Games Played, Games Winning Streak and the Rank in the Profile info and data feature of the game. The gamer can also see his friends achievements and stats. Moreover, the gamer can also select various profile icons to set as the logo. The abilities such as Autoroll, Multi-Attack, Slow the player, are also available as in-app features. These functions are used in the game to get an upper hand on your opponent. The gamer can also buy army crate, Rebel crate, Maximum crate, Emperor crate and War Lord crate from the store. The card package of five random Defense cards is also available in the store. The game has an inbuilt feature known as 9 tips to master the game which works as a guide book of the game. 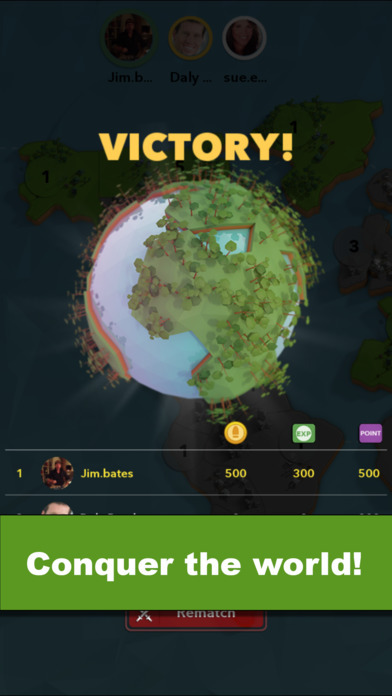 All the tips such as what a player should do after each turn, how helpful can the cards be, how to bribe, how to capture and hold continents, win and buy defense cards, use of chat function, and how to improve the play is mentioned in the brief. The gamer can see the all the top competitive players using this feature of the game. The player rank feature will help the gamer to locate its rank in the game and also will help to make the future strategy. The gamer can control the sound FX, music and notification alert using the setting feature of the game. Setting feature is common in every game yet most important too. The gamer can restore the purchases if made any previously and can also send the necessary feedback about the game to the developers. The gamer can chat and make strategy against opponents. Form an alliance with friends and make a group for an effective attack. The user can play in arctic, tropical and desert climate. 1) The gameplay is unique as it is consist of both games as well as chat. 2) Does not require much space for installation. Quick and easy installation. 3) The gamer can earn 100 coins per player as a recruitment reward. Recruit the new players, add them as friends and complete a game with them to earn 100 coins per player. 4) User Interface is simple enhancing the performance of the game. 1) Wait for next player to complete turn and then only can make the move. 2) Cannot play with more than 3 friends. The user interface of the game is friendly and unique. It has both chat and playing features at the same time and can be played with both friends and opponents. The new updates of Attack your friends might come with improved experience and new features.